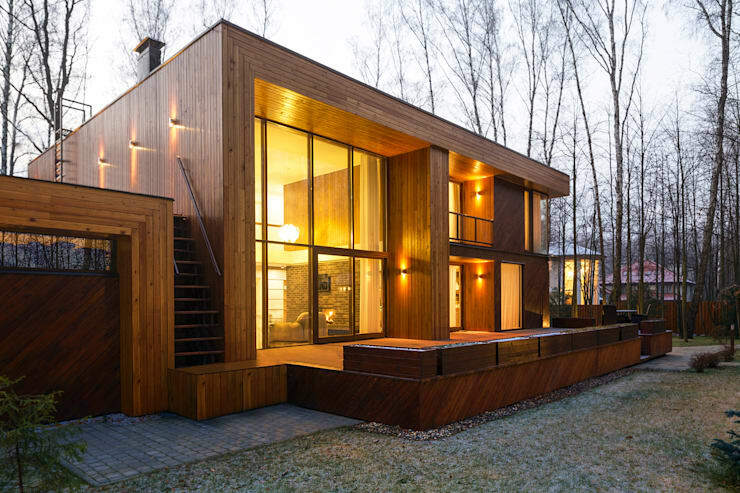 This lovely, country home, located in Ukraine and brought to us by Aleksandr Zhydkov Architecture, presents a striking, modern design, constructed primarily of timber slats. The home's facade exudes plenty of geometric style, as the timber flows around its glowing interior, framing the array of contemporary furnishings within. Floor-to-ceiling windows cover one side of the property, meaning that each room is bathed in the soft glow of country sunshine, while the interior decoration creates an atmosphere of modern luxury. The living room is populated by a range of comfortable, voluminous lounges and, beyond a wall of dark, grey bricks, the kitchen and dining room stand ready to accommodate a lively dinner party. The home's master bedroom exudes the enviable combination of classic and contemporary design for an air of extreme comfort, while the bathroom rests resplendent in a trio of crisp, modern finishes and luxurious bathroom fittings. All in all this home presents a haven of comfort and style, tucked behind a uniquely designed facade. Take a tour below and see what you think! From the outset this home impresses with its unique, modern style, as the flowing lines of its geometric facade carve a stunning silhouette amidst the surrounding neighbourhood. The deep, caramel tone of the home's construction appears warm and inviting, particularly when paired with its open interior, which glows from within, revealing a glimpse of the stylish, modern furnishings populating the home. Ample decking has also been constructed, in order that the owners can make the most of outdoor living whenever the weather allows. Moving through to the home's interior and we're embraced by a lofty, spacious living area, framed by floor-to-ceiling windows. A lovely view of the home's deck and garden flows through the glass panels, while the room inside has been decorated with a suite of voluminous lounges. A wall of dark bricks sections the living room from the kitchen and dining areas beyond, as classic timber panels flow upwards, adding a sense of elevation to the room and guiding the eye to the home's upper level. Beyond the grey, brick wall rests the home's kitchen and dining spaces, which have been designed to emit an air of modern style. 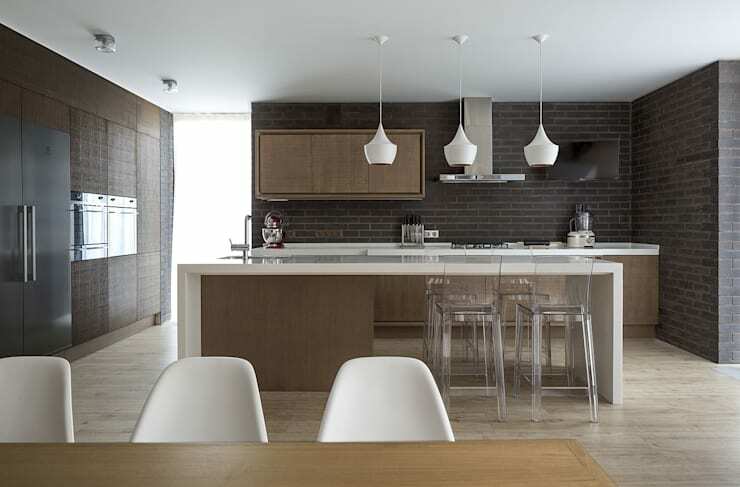 A muted palette of brown, white and grey creates a subdued effect, with the sheen of the room's white bench tops, stainless steel appliances and perspex bar stools adding a contemporary edge. The kitchen is streamlined, compact and filled with sunlight, providing the perfect environs for culinary creativity. Adjacent to the kitchen rests this minimalist dining setting, with its cool lines and shades creating a simple space to indulge and interact. A lengthy dining table stands ready to host a lively dinner, with an array of industrial-style light fittings hanging overhead to lend a sense of stylistic contrast. Best of all, the dining setting borders the home's decking, meaning that the party can quickly transition outdoors on a warm evening. The master bedroom in this lovely abode also benefits from an expanse of windows, providing soft illumination in the day time through the privacy of its pale curtains. 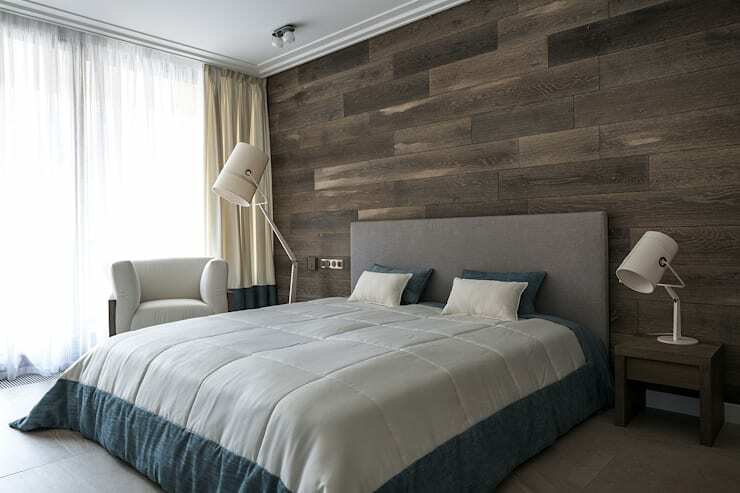 Timber panels frame the far wall, while a large bed rests central, ready to accommodate weary bodies. The furnishings in this space are of contemporary design, providing a lovely aesthetic balance relative to the timber panels finishing the walls, which emit a more classic, country design edge. 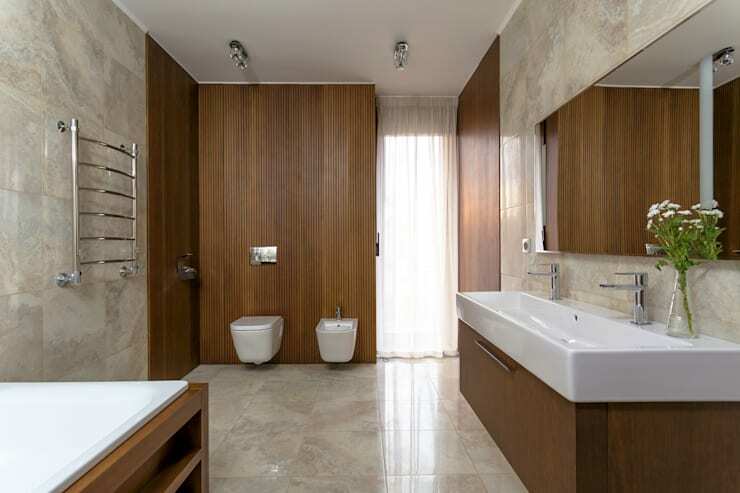 The home's bathroom presents a trio of crisp finishes which emit plenty of modern style, from the flowing marble floor tiles to wood paneling lining the walls and the pristine porcelain of the bathroom fittings. A lengthy, couple's sink and large bathtub demonstrate the spacious dimensions of this room, which is beautifully lit by a floor-to-ceiling window. The space presents the ideal locale for relaxation and indulgence, with its soft lighting and modern finishes creating a soothing atmosphere. Also included in this lovely home is a second, secluded living room for more exclusive relaxation and contemplation. The design of this space departs from its predecessor, with the palette comprised of a range of grey and brown tones for a subdued effect. Extensive, timber bookshelves provide space for a large library, while soft light flows through the room's large windows and from a contemporary light fitting hanging overhead. For another taste of a beautifully constructed, wooden home, take a tour of The Luxurious and Warm Log Cabin! What do you think of the combination of timber and glass characterising this home's geometric facade? Tell us below!